Last weekend, as I was walking to my weekend office (my favorite cafe in El Barrio, East Harlem Cafe), I passed the corner of 105th and Lexington, which had been under construction for the last months. Suddenly, I heard someone calling my name from inside the building. Sure enough it was Manny Vega, visual artist and mosaicist extraordinaire, who is well-known for his restoration of the Spanish Harlem mural on 104th and Lexington and the mosaics in the NYC subway station at 110th street. 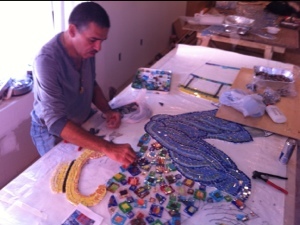 He was working on his newest project, a mosaic realization of the appliquéd series of public art that runs along the businesses from 104th to 105th in East Harlem (featured in the NY Times). 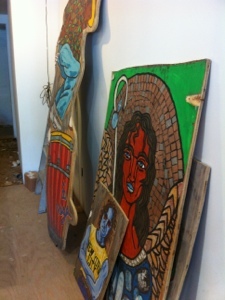 In the renovation of the building at 105th and Lexington, the art there had been removed in pieces, and the folks at 7173 Associates, LLC, and the owner of the long-standing neighborhood perfumerie, Exotic Fragrances, had decided this was not a loss they would let the neighborhood feel. Expected to run 20 feet long and 7 feet high, Espiritu: A Visual Prayer in Glass and Stone for the Here and Now, is Vega’s gift for the streets of East Harlem. It will be unveiled October 6th at 3:00 p.m.
And if I wasn’t already lucky enough to live in a neighborhood with such a vibrant art community, Manny Vega has been kind enough to take me on as an unofficial, part-time mosaic apprentice. We had met at East Harlem Cafe, where a commissioned piece hangs announcing their name. We began to talk technique and tools, and pretty soon, I had my first assignments. I studied, up close and personal, the mosaics throughout the subways stations in NYC (and got a more than a few weird looks as I stood nose to tile) and then on a trip to Russia, the Byzantine style that Vega practices. With pieces of construction paper and scissors, I drew then places tiles in channels, a Byzantine-style technique that creates the movement, depth and life seen in Vega’s creations. @writerswriting With audiobooks I like to DEAR and DREAM at the same time! 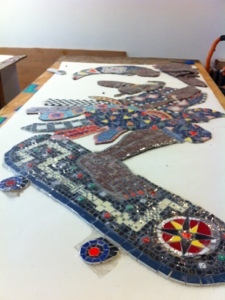 Part of Manny Vega’s mosaic mural Espiritu will be a piece that features The Trickster, a mythical creature that shows up across time and cultures. As a mosaic, Vega is afforded the ability to insert actual dominos and dice in his rendition of a modern-day Trickster, who gets around via skateboard. The dominos and dice are physical manifestations of the hustle, of the gamble, of the games today’s Trickster uses to entrap us. This physically-realized aesthetic and referent would not be possible in any other medium. I think this is the approach we need to take when thinking about digital literacies. What are the affordances of the medium that—if we took advantage of—would result in compositions that could do and be things otherwise not possible? A few of my grad students took to defining contemporary literacies last semester. Some of the results are here. Doug Belshaw, of the Mozilla Foundation, is writing a white paper on web literacies right now, and he is looking for input. What do you think these affordances are that we should be attending to in schools today? Via digital means we are now easily able to compose in multiple modes and, with access to the Internet, to do so in response to and in collaboration with international others. Such practices are, in fact, increasingly viewed as central rather than peripheral to literacy (Andrews & Smith, 2011). Critical reading implies a reader’s active response, as Rosenblatt (1938/1995, 1978/1994) long ago taught us. The interpretation of written language and image resides at the intersection of text, the reader’s personal experiences with other texts, and the social world. In a digital age, a reader’s response can become manifest materially (cf. Coiro & Dobler, 2007). When readers engage with a blog, for instance, they are able, indeed expected, to click on links, add comments, and reblog or remix content. Such response is a customary, expected part of the reading experience. Thus, the reciprocal relationship between reading and writing becomes tighter in the digital sphere, making authorship more obviously tantamount to readership, and vice versa. One way we could do this is change the DEAR program (Drop Everything and Read) and institute a DREAM program (DRop Everything and Make). As my old student Emily implied, this would include making meaning from existing texts, along with making new ones. I know from my Saturday afternoon with Manny, making is not just critical and creative, it can be healing. Previous PostI Know What You Read Last SummerNext PostDon’t Blink! My NY Comic Con Report is Here! As someone who is just coming to see how important making is to learning – this really resonated with me. I’m full of question now. What would DREAM time look like in schools? I’m also wondering how I can adapt it to make my DEAD time (drop everything and dissertate) feel more palatable. I know there are alternate dissertation forms but I think the academy is fairly closed down to the idea of transmedia, multimodality and the like finding it’s way into academic writing. Thanks for describing this experience in such detail, Anna. 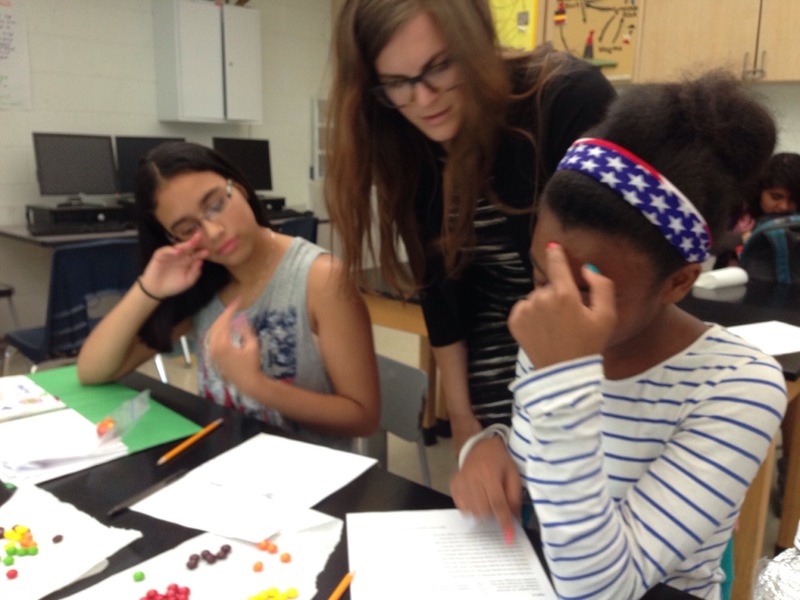 I, too, have been wondering about the many affordances of the “making” movement and how it connects to literacy. In fact, I am starting to wonder where “literacy” ends and other forms of communicating begin. If there are lines, they are getting blurred. Also, the types of “making” that happens in school is typically not true artistic expression, and that raises a number of questions too: what is the purpose of art/writing in school? In life? How do we think through the act of composition when prompted and on-demand as compared to when we pursue it from our own creativity? Great art. Great writing. Great blog post. Thanks! I really like that tension you present between reading and making; it plays with the notion that reading may not happen alone, or in isolation, of other endeavors. For those of us interested gaps between research and practice, it is a nice reminder of how else we can approach our experiences, as well as move them forward.